One question I was asked this week & didn't have an immediate answer to: "What's the least expensive meal you make that's Whole30 compliant?" After a little thinking- it's got to be soup! It stretches out into so many meals, and can be done so inexpensive. 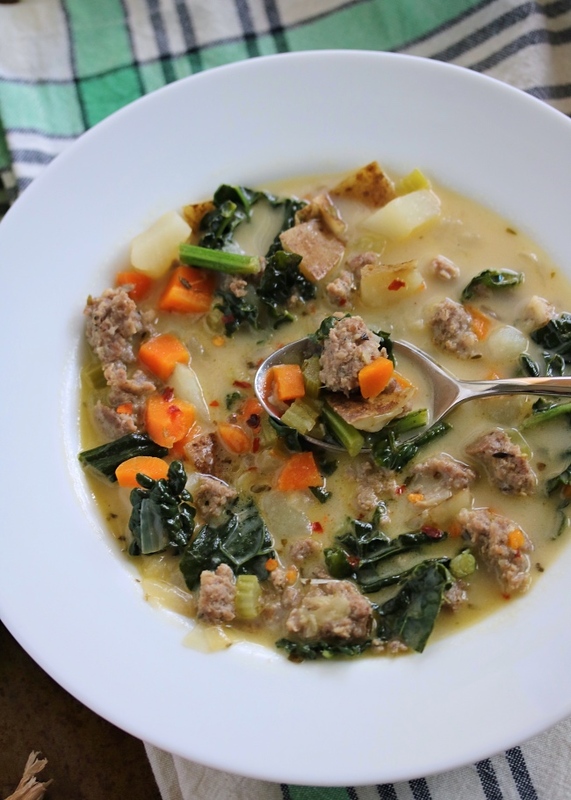 Of course you can spend more or less depending on what meat or broth you use, and how good the quality is. 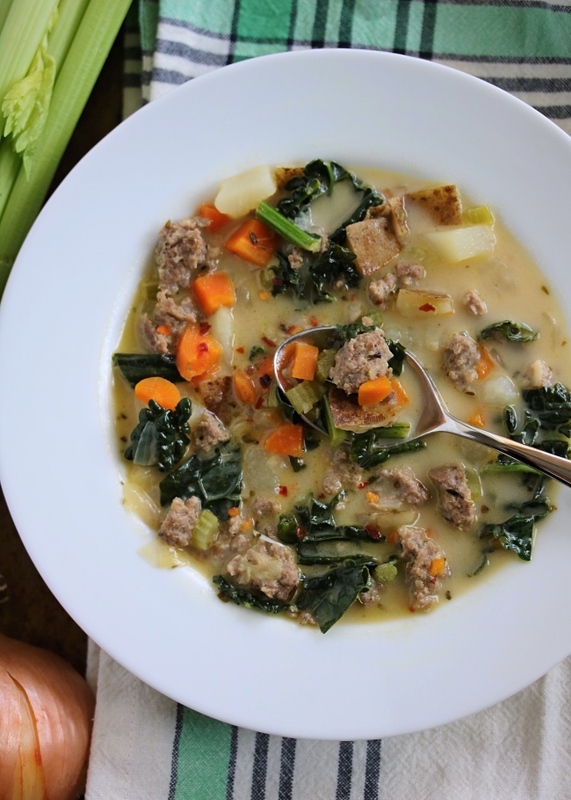 I love a good bone broth added to soups because it provides so much more protein and fills us up way more. If you're having trouble finding one, or it's not a game changer for you- go with a regular broth. You can find Whole30 compliant broths at almost any store now. I just did a Target "Whole30 Finds Field Trip" on my Instagram stories & was pleasantly surprised to find one at such a great deal. And Trader Joe's- they are killing it with the bone broth game with a super good quality organic beef broth for just $2.99! So keep your eye out- there are definitely more & more options popping up on store shelves! 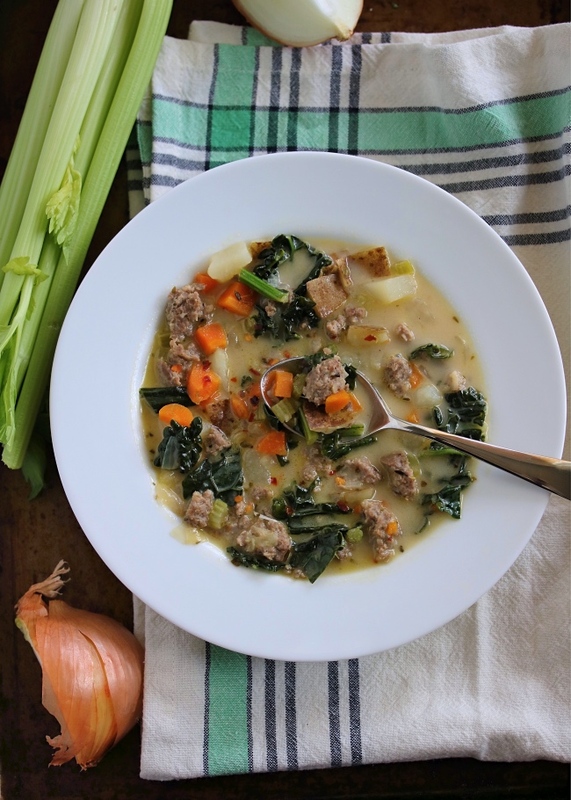 This soup was an immediate favorite the first time I made it, and I feel bad that it's taken me so dang long to get it on the blog. You guys have been asking- and I've been slacking. The herbs and spices make all the difference in this dish- I truly love the hint of nutmeg with the creamy base to this soup, and a pinch of red pepper flakes gives it just a tiny bit of heat. Shortcut it by using a pre-chopped "mirepoix" mix from the store (carrots, onion, celery)- I won't tell anyone! Hope you love this as much as we do, and thank you for being so patient! Add the pork sausage to a large saucepan over medium heat. Cook until browned and broken into crumbles. Add the onion, potatoes, carrots, celery, and garlic, and continue to sauté until the onions are just softened. Stir in your seasonings and the chopped kale. Add the bone broth and coconut milk, and season with red pepper flakes to taste. Bring to a low boil then reduce to a simmer, cooking for about 20 minutes or until the potatoes are fork tender. If you can't find Whol30 compliant ground pork sausage, you can substitute ground pork- just be sure to bump up your seasonings if needed! 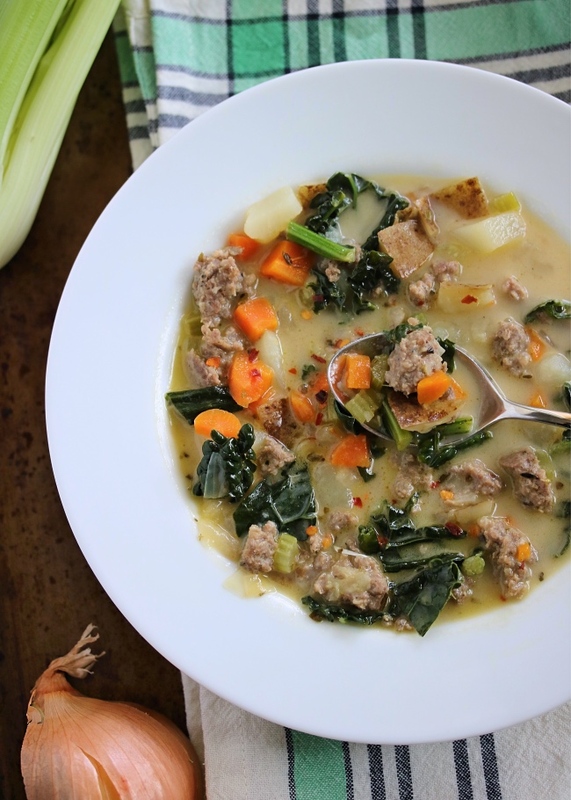 Any other potato will do, we just like the texture of russet potatoes in this soup. I don't peel them either- just scrub & chop! 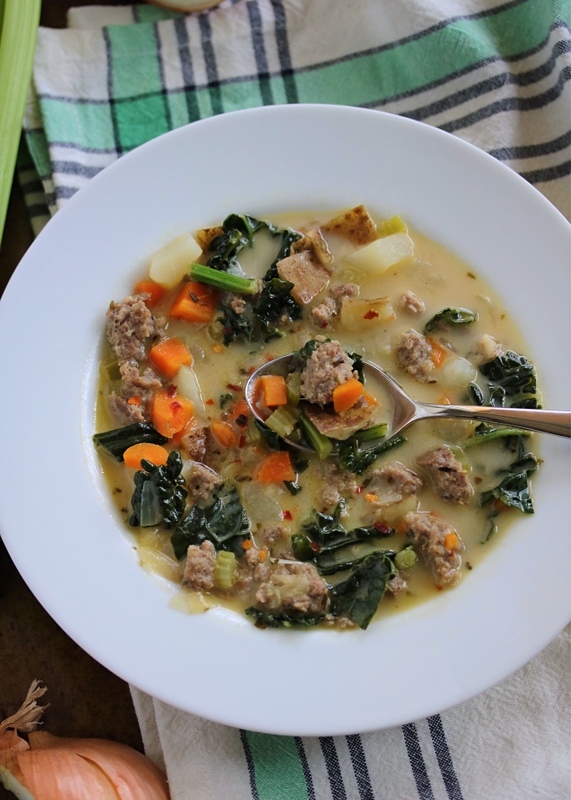 Because this soup is done so quickly on the stovetop, I haven't had a reason to try it in the slow cooker or Instant Pot. Would love to hear how it goes if you do! 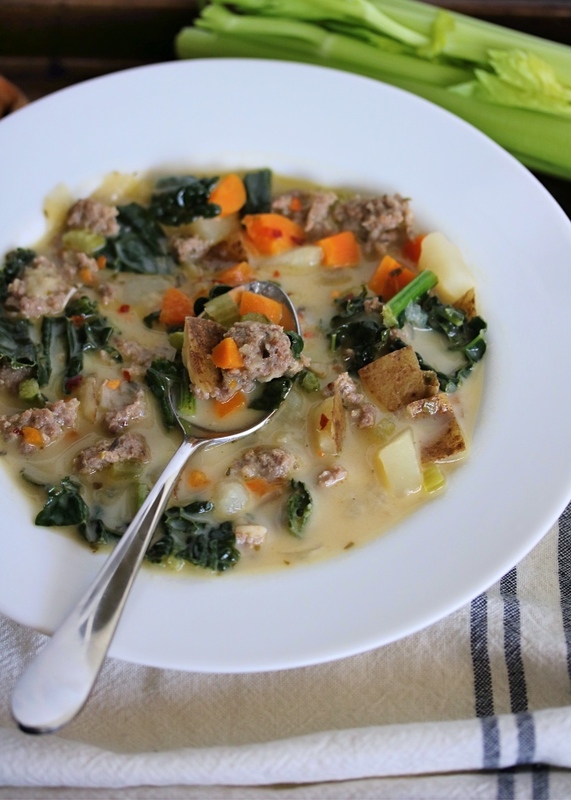 I'm getting ready for Whole30 #6, and this looks awesome as I love soup. Next day off, going to the store and getting what I need for this and getting my prep on! Thanks! How many dose this serve? Thank you! Also love this site, I'm new to the whole30 and love having this resource. Thank you for being so creative and kind to share this recipe. It was an amazing meal and very expensive to make. I am paleo so I eliminated the potato and used parsnips with garlic as well. The favors are great for Winter. Wishing you and your family a wonderful holiday. Made it today and it’s awesome! I didn’t have bone broth so I used chicken broth and I’m out of kale, but it was still delicious. Thanks for the recipe!